Do you want regular-read aloud times to be a part of your family culture? It is an essential for the homeschooling family, but is also a wonderful part of any family’s regular routines. However, without practice and forethought, read-aloud time can easily become a battle instead of a blessing. Here are eight tips for meaningful and fun read-aloud times. Pick one or two set times that you read aloud together. Ours are during mealtimes and before bed. It doesn’t have to happen every night, but making it a basic part of the routine will help the kids know what to expect and what their part is in it. Start small with one or two books and build up from there. Kids need to build up their “sitting muscles” too! Set an alarm to start early enough so that the rest of the bedtime routines can be done on time. If the kids can’t hold still, try allowing them to quietly draw or play with blocks while listening. Here’s a post from The Unlikely Homeschool with handiwork ideas kids can do during read aloud time. If a child is being particularly disruptive, excuse them to a room/chair away from the group until they can come back and listen quietly. Initially, read aloud time may be a necessary training/discipline opportunity. That’s not a bad thing! Explore the pictures and characters, asking questions and encouraging observations. Let them take turns turning pages. For rhythmic or rhyming books, let them chime in and read the easy parts with you. Allow a beginning reader to read the odd pages while you read the even ones. Let them make silly voices or help you come up with some for the characters. Continue the conversation later, pointing out things that remind of you of the story. Exodus Books (my favorite!) lists and recommendations, as well as their annual summer reading program lists. Not only will regular library trips help you stock up on good books often, your kids can become familiar with using the library and where different types of books are located. If the thought of taking all the kids overwhelms you, try taking one at a time. Show them how to find the books they want, where the audiobooks are, how to ask a librarian for a particular type of book, and so on. Take advantage of read aloud times at the library too! Making a record of reading progress is especially motivating for early readers, but you can do it for pre-readers as well. We have a simple grid printed and taped onto our wall. When we finish a half hour of reading time, the youngers put a sticker in a square. When 50 squares are filled in, they get a special treat or a pizza party. Another grid tracks the 6-year old’s personal reading progress, and he must read 3 books aloud to get a sticker. Written logs are also good for older children, recording the title and author of the book and when it’s completed. Make read aloud time fun and engaging! Occasionally pick different places to read, like in the back yard, at a park, snuggled in bed, or in the sandbox. Try simple extension activities after reading the book, such as pretending to be an animal from the story, acting out some of the scenes, making up songs to narrate the story, doing a craft, cooking a special dish, or drawing a picture. My kids enjoy reading some of the same stories over and over, and I’m (usually) happy to do that for them. However, read aloud time is a perfect opportunity to spice things up and expose them to different types of literature. It is worth the time and effort to make read-alouds a big part of your family life. They are educational, create great bonding times, and can make memories that last a lifetime. 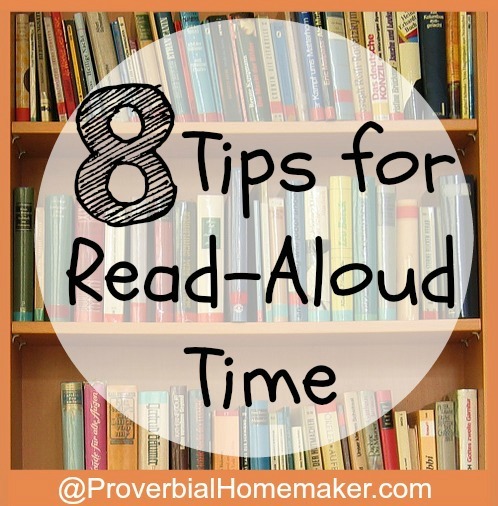 If you have regular read-aloud times at your house, what do you do to make them successful? 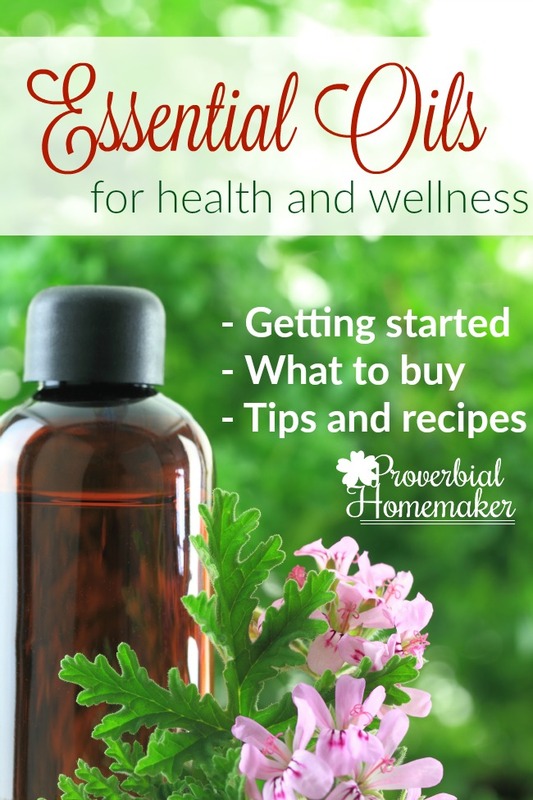 Follow Tauna Meyer (ProverbialHomemaker.com)’s board Homeschool Tips and Encouragement on Pinterest. Awesome ideas here!! I love this post – I will be referring back to it often! We are buying a new house and money is tight. This would bless our family because it would help us buy books for our 3 children. If I won, it would give me the opportunity to stock up on gluten-free baking products for our new gf lifestyle. We will be able to buy some new, much needed curriculum. This giveaway will bless my family by providing some “meat” to our curriculum. Right now, with piecing together what I can find free online, I’m struggling. And our budget is tight enough the next few months I’m not sure when we’re going to be able to buy the things on my wish list. This will definitely take care of my wish list, plus some. Winning this would bless our family as we are fairly new to homeschooling (started in January) and are still establishing a good set of tools and supplies, along with the places to organize and store them. With five boys to love & educate, we’ve got years of work ahead of us! It will bless our family because we’d be able to get some things that are very helpful for our special needs son, and lots of books we’ve been wanting. This is so great. It would allow us to get science materials and have the money to purchase additional curriculum. We would be able to buy printer ink to utilize all of the wonderful printables out there. We’d also love to get some more books and learning tools. Thank you for the chance to win! As a newer homeschooling Mom, I’m so excited to start this journey with my oldest who is four. We’re taking it slow, playing, crafting, reading, and working on setting a Biblical foundation. With a 1.5 yr old and one on the way, this would be so nice during a season of many added expenses. Thanks for offering this! Money is tight. My husband is retiring from the Marines. Not sure what God has in store for us yet. If we win, the money will help cover curriculum cost. That money was taken from our house fund. We are a growing family, number six is on the way, with a small, in need of repairs house. Wow great giveaway! We would clear the backlog of b0oks on our wishlist! We used to do read alouds but have gotten away from it the past year. Really re-kindled my desire to start back up again! This would bless my family this year allowing me to have curriculum not available in the library. We are in the middle of major financial changes and while we are no longer homeless or jobless we have a lot of catching up to do. It would give us the funds to travel to see my husband’s aging grandparents. What a blessing that would be for my kids! It would help tremendously in buying our Math curriculum and living books. My husband works 2 jobs to support us and money is still tight these days. Winning would be a huge blessing to our family. We are currently remodeling our basement following a water leak and would love to add more books/supplies to our learning area which is located in the basement. Winning this would be amazing and allow us to get the books and supplies we need for our second year of homeschooling. Right now our household has no steady income and we are trying our best to continue homeschooling. Finances are very tight. This would be a blessing. Like a lot of people have already said, money is tight with only having one income. This would help get some extra supplies for our homeschool, as well as get a good start with Christmas shopping! Winning this would be a huge blessing. homeschooling is hard much less being on a single income to do it. curriculum was expensive this year and now we have had unforseen expenses on our vehicles. I am starting college myself, so no money for curriculum for the kids. Making due with online resources and some ingenuity, but BOY would it be helpful to be able to buy some curriculum for some areas. We are homeschooling our three boys, and between the grocery budget and school curriculum, any little bit will help!! 🙂 Thank you! I give my girls (3 and 5) book themed color sheets to color as they listen. We were recently hit financially with car repairs, root canal, etc, and this would be an amazing blessing!!! Thank you for the opportunity and thank you for doing this to bless someone! We love read aloud time. My other tip is to start young especially with wriggly boys! My oldest daughter needs braces. Our 14 year old van is on its last miles. We recently bought a fixer-upper house. $500 would definitely be a blessing. I’m working on writing our own curriculum right now, just because we can’t afford the one I want. Winning enough to buy (most of) it would be awesome, and such a time saver! $500 would be a huge blessing to our family of 8. There are always curriculum items that could be beneficial for 1 or more of my kiddos that we just can’t afford. And thank you for the lovely article. Great ideas! Winning this giveaway would be amazing. We have large medical bills that leave us with no money for all of the math curriculum we’d like or for much in the way of field trips. This money would be a great start for my daughter who is now homeschooling her family. It would allow us to buy quality art supplies, some lessons, and some museum memberships! The prize will be a blessing that allows me to finish purchasing curriculum items and books for our six children for this new school year. Thank you for offering a wonderful giveaway. We are to homeschooling and would use it towards supplies and organizing our school. Thanks for the opportunity. We are struggling financially for this school year. Winning the giveaway would greatly bless us! We are only in our second year of homeschooling our 6 children ages 2 -13. That would help us buy so many books!! 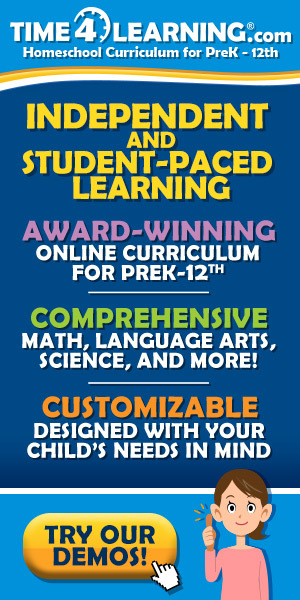 If I won I would use the money to buy Oak Meadow’s first grade curriculum for a friend who is homeschooling for the first time. She really wants to use the program for her daughter but they can’t afford it right now. Winning this would bless us in o many ways. It would greatly help us purchase new supplies and allow more time teaching rather than working to buy new things. We are in desperate need of newer supplies. We are a new homeschooling family, and I didn’t realize all of the expenses to set up a classroom! This would help buy curriculum, books, and supplies! Winning this money will help in getting the kids the best materials necessary for our journey! Little guy was diagnosed with kidney cancer this spring so finances have gotten a bit tight around here. He is doing great and we already started first grade but supplies are always needed!! Money has been so tight this past year and the money would greatly help out buying curriculum for our 4 kids. There are definitely lots of books on our list that this would help us buy, plus some extra manipulatives. What a great blessing this would be! We would put the money toward musical instruments for our homeschool. Thank you for the opportunity! We have been using curriculum that has been given to us the past 2 years, which has been a blessing, but it would be wonderful to purchase something new that I feel would fit my children and our family better. 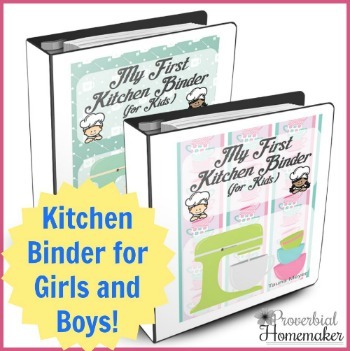 Husband is between jobs (this it NOT a bad thing…we’re trying to get a business launched) but have $0 in the budget for any school material, at least for another 2 months. It’d be great to be able to buy the items I’ve been adding to my wish list. I still need to buy our math and English! The money from this will help pay for my son’s violin class. He loves it so much but the cost does add up! Winning would be a blessing by allowing for more field trips and would also allow us to purchase some effective teaching items for our unit studies. I would purchase curriculum for my kids.